If you hadn't noticed, it is the 1st of December and the count down to Christmas has begun, anyone as excited as me?? As a small Christmas gift to all you lovely readers, I have some giveaways coming up over the next few days. First up is a giveaway from the lovely people at WOW toys. I previously reviewed the lovely Flora's Fairy Garden which my girls absolutely adore. Up for grabs today is a Ronnie Rocket. 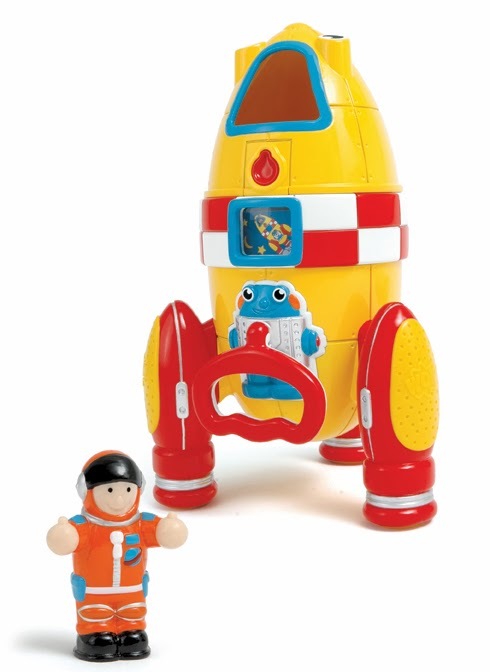 This lovely space rocket is all ready for out of space adventures. Complete with a pull cord on the front, you can watch the rocket vibrate as it begins to count down for its next journey. And as an added surprise, Major Tom is hidden inside so when you push the secret button you will find him sitting in the cockpit awaiting instructions on what to do. If you fancy winning this awesome prize just fill out the rafflecopter form below. The competition closes at 11.59pm on the 7th of December 2013. This is so cute. My son is increased with space & rockets. He'd love this.